SKYBRARY: A WIKI FOR AVIATION SAFETY KNOWLEDGE EUROCONTROL, an intergovernmental aviation industry body, is committed to making European aviation safer, more secure and more environmentally friendly. That means providing a forum where civil and military aviation specialists can learn from safety lesson promotion and best practice dissemination. 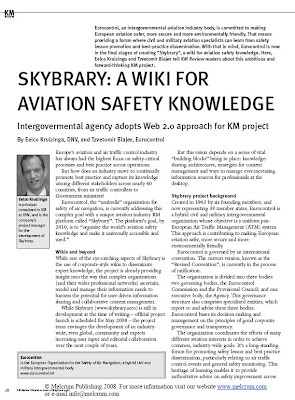 With that in mind, EUROCONTROL is now in the final stages of creating “SKYbrary”, a wiki for aviation safety knowledge. Here, my colleague Eelco Kruizinga (DNV) and EUROCONTROL's project manager Tzvetomir Blajev tell KM Review readers about this ambitious and forward-thinking KM project. KM Review Vol 11 Issue 2 May/June 2008 (Melcrum).